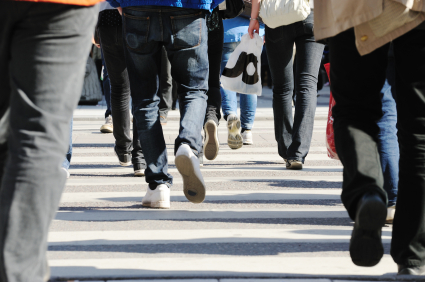 Employment growth steady so far, but what will the rest of 2014 bring? 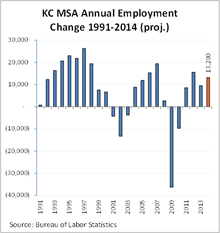 The April employment data shows the Kansas City area in a consistent growth pattern. Using seasonally adjusted data, regional employment has grown by 4,400 jobs and the growth has been fairly consistent thus far. We're not yet midway through 2014 and a lot of things can happen, but it is informative to project this growth rate we've seen through April and look at where 2014 might stack up compared to recent history. If we keep up our current pace, it will translate to a gain of 13,200 jobs by the end of the year. This would be a solid performance, but not a particularly great one. Taking a look at some historic data, we see that the Kansas City region’s employment growth regularly topped 20,000 per year during the mid-1990s. This is a feat we have not been able to duplicate since 1997. We are not likely to top the 20,000 new job mark this year, but it wouldn’t be surprising to do better than the projected 13,200 level. There are three industry-based reasons for our optimism. First, construction appears to be back, and it will continue to grow as major projects (like Ikea, the downtown Streetcar and Cerner’s Bannister Campus) continue or get underway. Second, manufacturing remains strong — 1,700 manufacturing jobs have been added this past year. We are seeing more auto parts suppliers settle in the region and we will soon have 600 new jobs at KCI’s overhaul base thanks to Aviation Technical Service. And finally, after years of employment loss, our information sector has stabilized and even shown some growth in the past year. 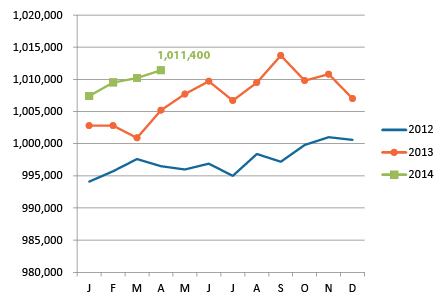 Employment continues its steady growth pattern in 2014. 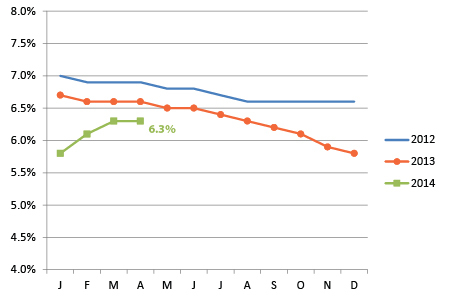 The seasonally adjsuetd unemployment rate remains at 6.3 percent. 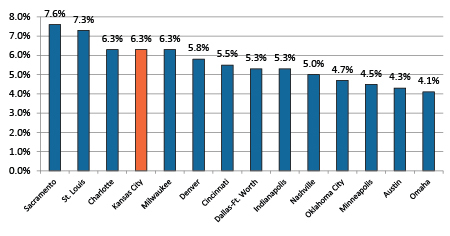 The Kansas City metro unemployment rate has been steady, but many of its peer metros are now doing better. 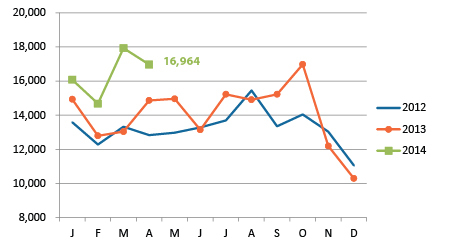 There were just under 17,000 unique help wanted ads in the metro in April. The Kansas City region is one of 35 U.S. communities selected to participate in Lumina Foundation’s community-based postsecondary education attainment strategy. The Mid-America Regional Council led a coalition of civic, government, educational and business partners in a successful application to join the Lumina initiative. Lumina’s strategy is designed to help communities and regions dramatically increase the number of local residents with postsecondary education credentials. As a participating region, Kansas City will benefit from significant technical and planning assistance, data tools, flexible funding, and the ability to customize attainment plans that will best suit the community’s needs.